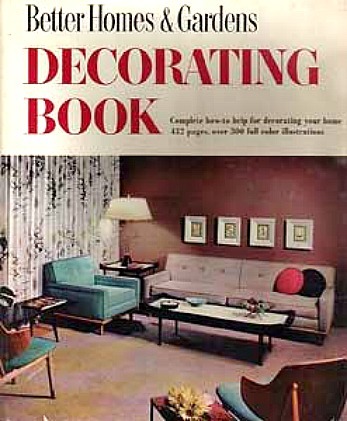 When I saw this vintage decorating book published by Better Homes and Gardens in 1956 on eBay, I had to buy it. It’s in an aqua-blue binder with illustrations like the one above acting as chapter dividers. I especially enjoyed the photos of “modern kitchens” and thought you’d get a kick out of seeing them, too. The chairs and table in this kitchen look like something you might find at a store today. Not sure what the horse-and-jockey wallpaper is all about, though. What really interested me about this next kitchen–besides the liberal use of aqua blue and the funky wallpaper that goes up from the soffit onto the ceiling–were the stainless-steel appliances. The room doesn’t look as dated as it would have if the oven had matched the cabinets. 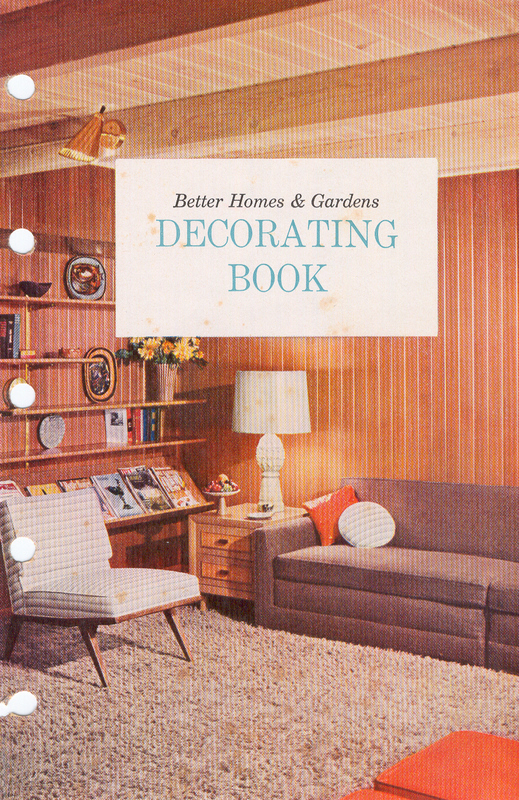 I can almost imagine this being in a contemporary home today. Aren’t those fun? I’ll be posting more illustrations from the book and photos of rooms it featured soon, so if you liked these, check back for those! ooh, i love it. those are so cool. of course in reality, i’d rather have a modern kitchen, but i certainly love visiting these! I love these, too! 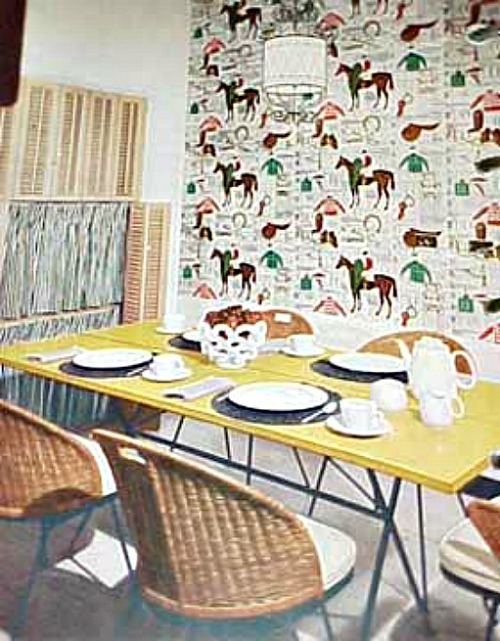 If I bought a house with one of these kitchens — even with the cowboy wallpaper — I’d leave it as is. And I think the pink/yellow/aqua kitchen might even feature Russel Wright dinnerware, one of my favorites. These just make me want to don an apron and shake up a martini. What a fabulous post and a fun blog! Thanks for the mention! I love these photos, and your site is great — I’m really into 1950s housewife culture (I suppose that’s what you could call it? ), so this was fun to see. Cheers! can u put more pic with deatil of 1950 kithen…. thank you !!! I appreciate people’s thoughts on colours etc. I think I must be mad! I’ll be adding photos soon. Love these pictures! 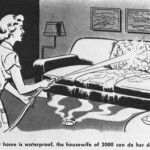 I recently posted on my blog about Home Staging on Active Rain some examples of what makes a home look dated. These examples are perfect. and just emphasize that what is cutting edge now can become dated in 7-10 years and outdated in 20. Then in 30-40 years it can become Retro! 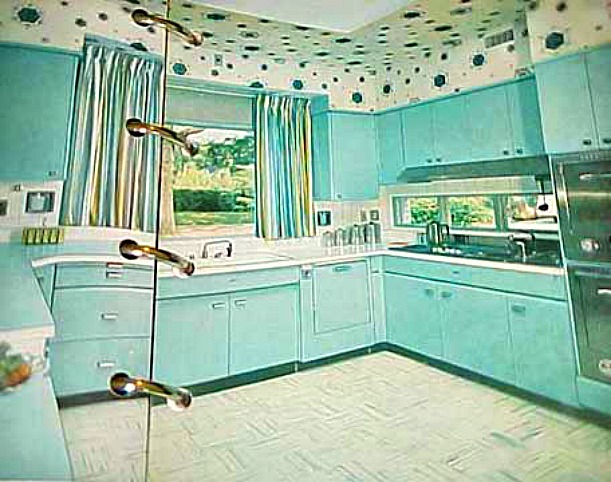 I have a complete aqua 50’s kitchen. Electrical stove, oven in perfect condition… lots of cabinets. I have a complete yellow metal 1950’s kitchen I would like to sell. It is complete with GE matching stove, kelvin fridge, and extra detached cabinet. I have an all pink kitchen. Stove top and oven pink and works great. 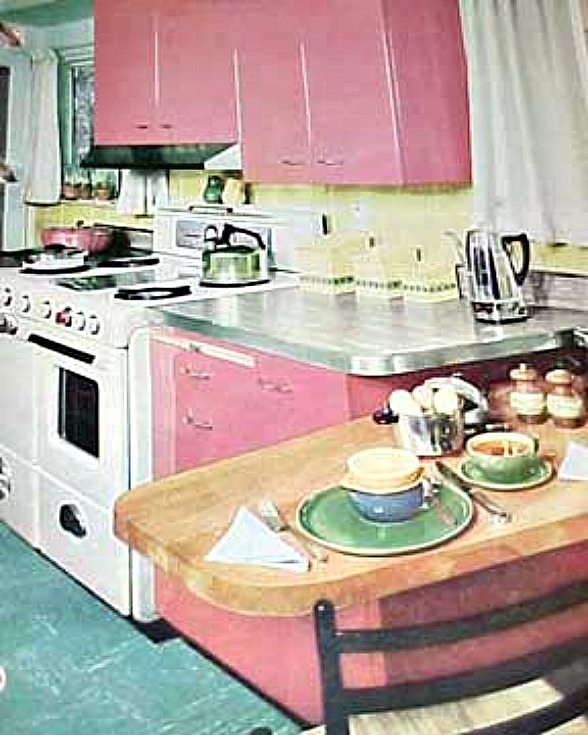 The cabinets are 1956 pink, but they have been painted over pink. I would love to sell all for the right price. This is for DeAnna Cooper. I was wondering if you could email info on this yellow kitchen you are looking to sell…if it is still available? Any pics and info would be welcome and also where you are located. 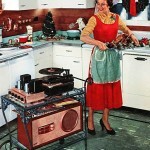 If anyone is in the New Jersey area and selling any 1950’s kitchen appliances please contact me. My home is art deco and I am now in the process of creating a 50’s kitchen. Any items from the 30’s & 40’s are welcome also. I just moved into Bergen County and have many working pristine condition 1950’s appliances if you are still interested. Everything from stove/ovens that are spotless and in working order to a working Philco refrigerator and larger Jordan Freezer. If you are interested in taking a look before I call some collectors, let me know. Hey Peg, I just read your recent reply of January 17th. I really enjoyed looking over this website because of all the great memories it brought back when I was a little girl. My mom, rest in peace, was the type of person who upgraded her kitchen appliances on a regular basis but had a peculiar habit of keeping the originals also. One of her favorites was Sunbeam’s model #CF cooker and deep fryer. I still use this appliance all the time making fried chicken, onion rings and fried fish. It’s an antique and it still works! When my friends come over for dinner they’re amazed at the quality of the food. Guess they don’t make ’em like they used to! Thanks Diane….I’ll keep my eye on this site…looks great! These are great images, thanks. 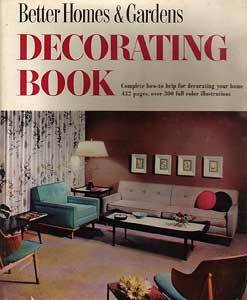 I was looking for 50’s colours as I am redecorating my kitchen, post divorce. 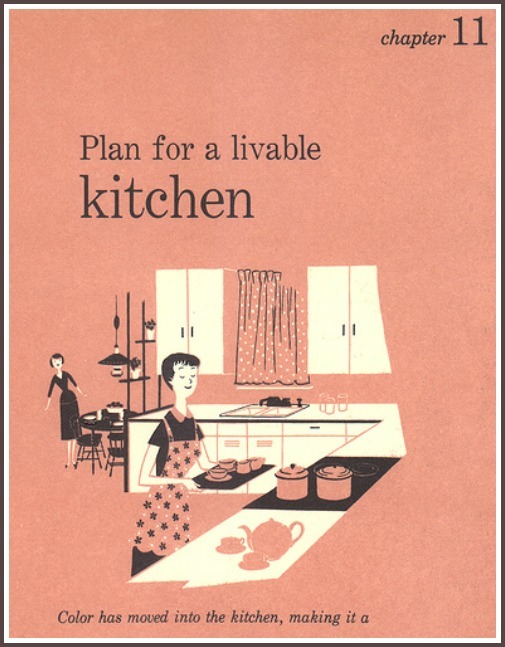 Not sure why I seem to be hooked on the 50’s for my kitchen, I wonder if the cheerful pastel colours of the 50’s are my kind of post-war optimism? My local vintage store had a 1950’s apron with yellow and black print on white background which I bought. I also have a small number of bright red items that look really 50’s to me. It seems like an odd colour mix but they did seem to have a number of colours which seemed to work. I suppose the pastels worked with the strong yellow or reds. I was so excited to see on this site, my oven, that I just purchased! 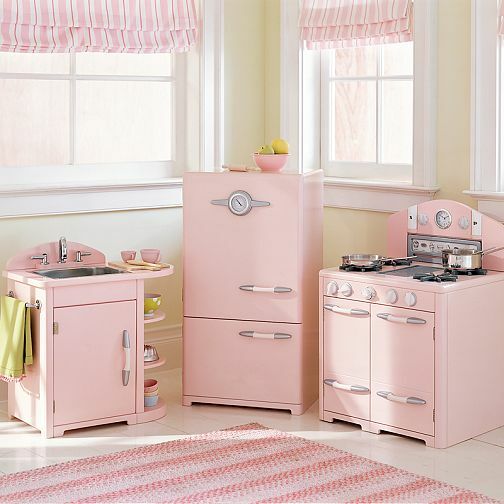 I am remodeling my kitchen with a 1950’s theme and found the RCA Estate Range that is shown above in the original pink kitchen. I found it on Craigslist here in Spokane, WA and talked the owner down from $450 to just $75 dollars. I am so proud of it and am very eager for my hubby to install it this week! I will keep this page bookmarked for more updates! The kitchen in my unquestionably 1977 track house has undergone many transitionary incarnations. At this time is seems to be a 1930s kitchen updated with newer appliances, a fabulous 1951 Westinghouse two oven stove and a 1954 Hotpoint refrigerator. The sideboard and dining table are from the 1930s, a 30s toaster and waffle iron keep a 1950s vacuum coffee maker company on the Cosco kitchen cart. If it wasn’t for the micro-convection oven above the stove, it would look like it had evolved over those decades. Something funny happened when I replaced my newer high tech high efficiency appliances with the older TANKS. I started cooking more and my power bill went Down. Can i get a picture of your 1954 hotpoint fridge? jbaxter71112@yahoo.com e-mail me a pic please. My aunt passed away several years ago and many of her household items were sold with the exception of a metal kitchen cupboard that is currently taking up room in my garage. It is a free-standing unit with sliding glass (original) on the top two shelves, an open area, a large drawer and two doors on the bottom. It needs to be repainted. It is white. 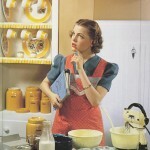 In the drawer, I found several 1950’s cook books. I will leave them with the cupboard. I live in northern California so please email me and we can discuss price. We have a total early 1950s kitchen with numerous cabinets. All the cabinets are Geneva Modern Kitchens of that vintage–metal painted white. They are showing signs of their age. Can any one steer us to a source that can replace or repaint the original doors? We are in the Catskill Mountaains of southern New York State.